The online streaming service Netflix changes things constantly on the site and monitors carefully what users do and don't do when they interact with the service. You may have noticed that Netflix uses A-B tests to determine the effectiveness of covers or other element on the site, but did you know that Netflix customers may be included in beta tests and experiments on the site automatically? Inclusion in tests and previews may not be a bad thing, at least not for all users; if you like to have access to new features as soon as possible, then that is certainly the right option for you even though there is no guarantee that your account will be picked for any of them. Netflix notes that participating customers help the company improve the experience on Netflix and access new features before anyone else. Participate in tests to help improve the Netflix experience and see potential changes before they are available to all members. Netflix does not reveal to customers whether they are part of an experiment or not at the time. You may notice differences if your account is signed up for an experiment, but there is no confirmation for any of that. It is unclear if all Netflix users take part in tests automatically; when I checked whether the test participation setting on Netflix was turned on for my account I noticed that it was and that I did not opt-in to that by myself. Here is a quick guide on finding out if your account is set up for participation in tests and previews. Some Netflix customers may join the program if they have not been added to it automatically, others may want to leave it if they prefer the standard experience instead. Note: Test participation is linked to the account and not to user accounts. The change is valid for all accounts if you disable or enable the feature. 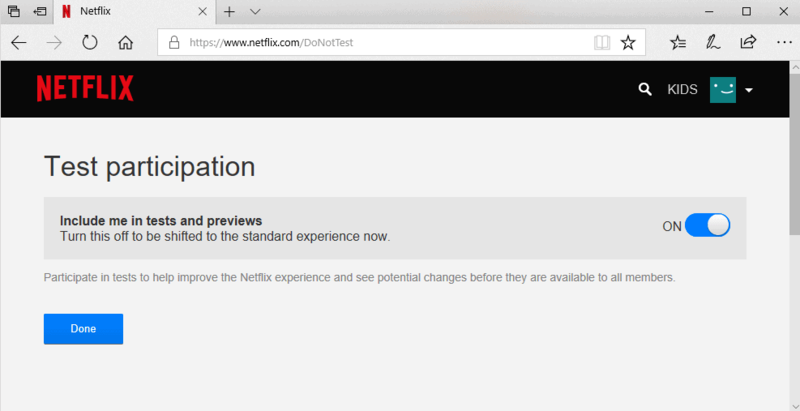 Load https://www.netflix.com/DoNotTest in the browser's address bar. You may enable (on) or disable (off) test participation on the page that opens. You may use the option above even if you watch Netflix on a TV or mobile device. Since the setting is linked to the account, it carries over to any device you use Netflix on. Some applications or TVs may not provide access to the full list of Settings. The Windows application, for example, opens the Netflix account page in the default browser when you select Settings > Account Details. It offers no option to join or leave the test participation program of Netflix. Now You: Do you have a Netflix subscription? No, I cancelled my Netflix account in response to their efforts in pushing the EME into HTML5. Thanks again Martin for a great tip. I turned off the test subject slide switch.